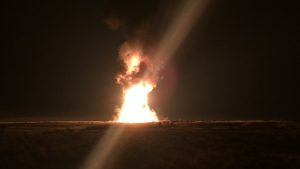 Juab County officials detonate 11 tanker cars carrying propane and biodiesel that derailed in remote central Utah desert. Pulver posted photos and video online showing the fireball about 75 miles (120 kilometers) south of Salt Lake City. The nearest town is Eureka, with less than 1,000 residents, about 15 miles (24 kilometers) away. Union Pacific spokeswoman Kristen South said the company is clearing the derailment site, repairing the railroad track and working with environmental officials to determine what needs to be done to deal with the impacts of the crash. 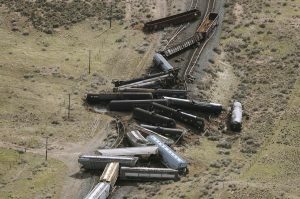 The cause of the derailment is under investigation, South said.